Wighill Park Guns | Products | Nikko Stirling Mount Master 4×32 Telescopic Scope. 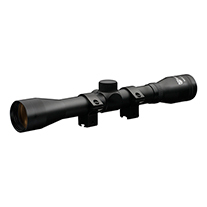 Nikko Stirling Mount Master 4×32 Telescopic Scope. Scope tube size is 1″. Total Weight 340 grams with mounts. Suitable for most modern airguns. Complete with mounts to fit 11mm dovetail rails.